The picture (Figure 1) occurs in the book, Les diamants et les pierres precieuses by Professor Diuelafait in 1874. It shows perfectly a gem testing technique which was used successfully by Austrian Professor Haidinger in 1858 to disprove the identity of a large 819 carat gemstone, previously certificated as a diamond by L'Athenée des arts, sciences et Belles Lettres de Paris. 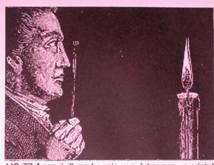 By holding the stone, table facet to the eye, and looking towards the candle flame, some, though not all, the various primary images of the flame (each one coming from one of the pavilion facets) showed a doubled configuration – double refraction, a property impossible in a diamond. The probable identity is that the stone would have been a colourless topaz, as diamond and topaz share a close to overlapping density, and to be fair, there were not many other testing options open to the gem tester in those days, before the advent of the refractometer or spectroscope. The information on Haidinger, and the above photo, was communicated to me via Dr. Don Hoover, an enthusiastic teacher of gemmology, and an exponent of this gem-to-the-eye method of observing a gemstone. In fact Haidinger did not identify the stone as a topaz, he simply used the fact that, as the primary images had doubled, this ruled out the possibility of a singly refractive diamond. The photo (Figure 2) was obtained by looking through the topaz towards a fibre optic light source. 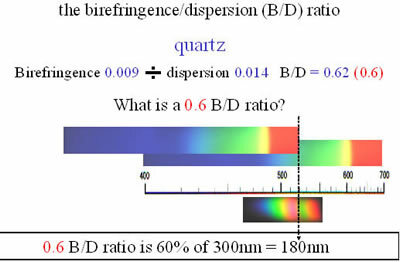 Note the two red components of the image which indicates double refraction with a birefringence/dispersion 'B/D ratio' of ~0.7 (Explained in Figure 9). Identity elimination, or 'identity narrowing down’,'are the two main advantages of Visual Optics, as there are fewer examples in which the gem is actually identified and some of these will be discussed later. To practice the method, hold a faceted gemstone positioned, table facet close to the eye, which should be almost closed. Start with a larger stone if possible, and the ideal gem is a peridot. A tourmaline is almost as good, and failing that, a large transparent quartz variety. The benefit of a peridot is that it combines low refraction with high birefringence. The lower the RI of a gem, the easier it is to see the primary images which form on the observer's retina as a pattern. Each Primary comes from one of the pavilion facets. The pattern of the images is therefore a replica of the pavilion facet layout (Figures 3 and 4), though you may have to maneuver the gem in order to locate the whole pattern of images. The higher a gemstone's refractive index, the further the Primaries are pushed from the central area. By the time the RI is in the region 1.9, as with a zircon, a round example will perhaps only show three Primaries at one time (Figure 8). The others from the remaining pavilion facets can be located by rotating the stone, but generally only three or four remain in view at one time. The normal 'High’' Zircon's birefringence of 0.06 divided by the dispersion 0.04 gives a B’D ratio of 1.5 at the maximum separation. So how exactly is the B/D ratio arrived at when viewing the doubled Primaries? (Figure 9) illustrates the B/D ratio. Ruby or synthetic ruby has a unique Visual Optics aspect. Any light source looked towards through the ruby, the images appear red and blue.  This is because the ruby absorption spectrum absorbs the other spectrum colours. Diamond, CZ and synthetic moissanite could perhaps be termed the "terrible trio" of the jewellery trade, and various testing instruments have been developed to distinguish between them, and so identify diamond. Visual Optics offers a useful approach when there is no 10x loupe or other tools available. Diamond (Figure 12) is distinctive by its randomly scattered Secondaries. These are tiny sharp spectral images which become dimmer with each reflected bounce within the diamond. If the diamond is a well-proportioned brilliant or princess cut, light cannot escape through the stone from the main pavilion facets, and so no Primaries are seen. This is because of the diamond's high refractive index 2.42 causing Total Internal Reflection. In a shallow or over-deep cut diamond, light escapes and Primaries do form, but they are not as long as those from a CZ, and form nearer to the observer. Regardless of how well proportioned a CZ is cut, it can never stop the escape of light with its RI about 2.1, and so Primaries are formed. Usually three form from a round gem (Figure 14). Zircon is similar (Figure 8), but then the zircon's Primaries are doubled. Secondaries do also form in a CZ, but they are not quite so sharp as from diamond. What is the difference between Primaries and Secondaries? Primaries form in a direct pattern arrangement to that of the pavilion facets of the stone tested. Secondaries are the result of multiple bounces of the images from the girdle facets. They therefore form a random scattered pattern. This is true of synthetic moissanite, where the higher refractive index than diamond, means that there are virtually never any Primaries seen. What are seen in Figure 13 are random Secondaries. In contrast to diamond's sharp spectral Secondaries, those in synthetic moissanite are like blurred spectral snowflakes. Ideally the light source should be at the eye level of the observer whether sitting or standing. A penlight is ideal if standing. Gemstones in jewellery can be used, though they do need an open or claw setting. The B/D ratio of a gemstone can be worked out from any standard gemmological book of tables; simply divide the birefringence by the dispersion for the B to G interval. The author recommends you form a twosome or more if possible, of keen gemmologists, and organise an occasional evening of Visual Optics practice. Alan Hodgkinson, with 53 years in the jewellery industry, is a much traveled lecturer and educator whose work covers many aspects of the field. He has done extensive work on emeralds, opals, and diamonds, but he is perhaps best known for his innovative and highly effective "Visual Optics" approach to gem identification and other practical gem identification techniques, including ways to see and learn more using traditional gem testing instrumentation. He is the originator of the Synthetic Emerald Filter, and the Stained Green Jadeite Filter. He is the author of Visual Optics, and a new book, Gem Testing Techniques (to be released in 2011), and many articles on gem identification. Alan is a Fellow of the Gemmological Association (FGA) with Distinction, a Freeman of Worshipful Company of Goldsmiths, Honorary Member of the Canadian Gemmological Association, an Honorary Registered Valuer (UK), and President of the newly formed Scottish Gemmological Association. Alan was the first recipient of the AGA Antonio C. Bonanno Award for Excellence in Gemology in the year 2000 and Winner of the David Wilkins Salver from the UK Institute of Registered Valuers. Alan's Mission statement is "to share and encourage in others an enthusiasm for gemstones and the fascinating world of gemology." © Copyright AGA Guest Speakers / Related Authors. All rights reserved.